For decades, scientists have said that at least some of Earth’s water came from comets and asteroids. New research suggests an even more primordial source, the vast cloud in space from which our world formed. Earth, the water planet. Image via NASA. Earth is rich in water, and has been for a few billion years, but scientists are still debating just where all that life-sustaining liquid came from. At least some of it was thought to have been brought here by comets or asteroids, but that idea still falls short in explaining how so much water ended up on Earth’s surface – and deep below, as well. Now, a team of scientists at Arizona State University (ASU), led by Peter Buseck, has come up with a new proposal. The new peer-reviewed paper was published in the Journal of Geophysical Research: Planets on October 9, 2018. The new research suggests that Earth’s water came from both rocky material, such as asteroids, and from the vast cloud of dust and gas remaining after the sun’s formation, called the solar nebula. 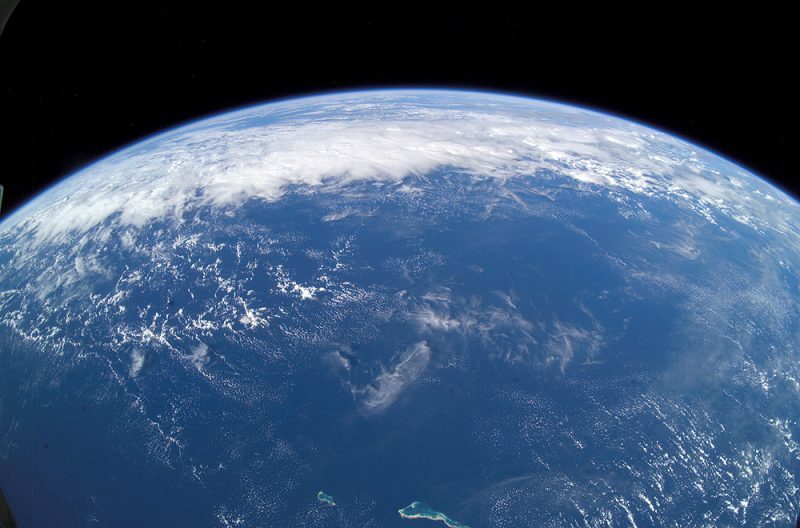 The hydrogen in Earth’s oceans may not represent the hydrogen throughout the planet as a whole, however. Samples of hydrogen from deep inside the Earth, close to the boundary between the core and mantle, have notably less deuterium – indicating that this hydrogen may not have come from asteroids, after all. The noble gases helium and neon, with isotopic signatures inherited from the solar nebula, have also been found in the Earth’s mantle. How to explain these differences? The researchers needed to develop a new theoretical model of Earth’s formation to answer that question. According to the model, Earth was the largest of many planetary embryos – aka protoplanets – in the early solar system. Essentially, their model shows large, waterlogged asteroids eventually forming into planets like Earth through collisions. The surface of the very young Earth was initially an ocean of magma. Hydrogen and noble gases from the solar nebula were drawn to the planetary embryo, forming the first atmosphere. Nebular hydrogen, which contains less deuterium and is lighter than asteroidal hydrogen, dissolved into the molten iron of the magma ocean. Hydrogen was then drawn toward the center of the Earth – a process called isotopic fractionation. Hydrogen was delivered to the core through its attraction to iron, while much of the heavier isotope, deuterium, remained in the magma which eventually cooled to form the mantle. Impacts from smaller planetary embryos and other objects continued to add additional water and mass until Earth reached its final size. Also, comets have higher deuterium-to-hydrogen (D/H) ratios, so they are actually not good sources for Earth’s water. The D/H ratio of hydrogen gas in the solar nebula was only 21 ppm, too low to have supplied most of the water on Earth. Asteroids are a much better match, along with the solar nebula. 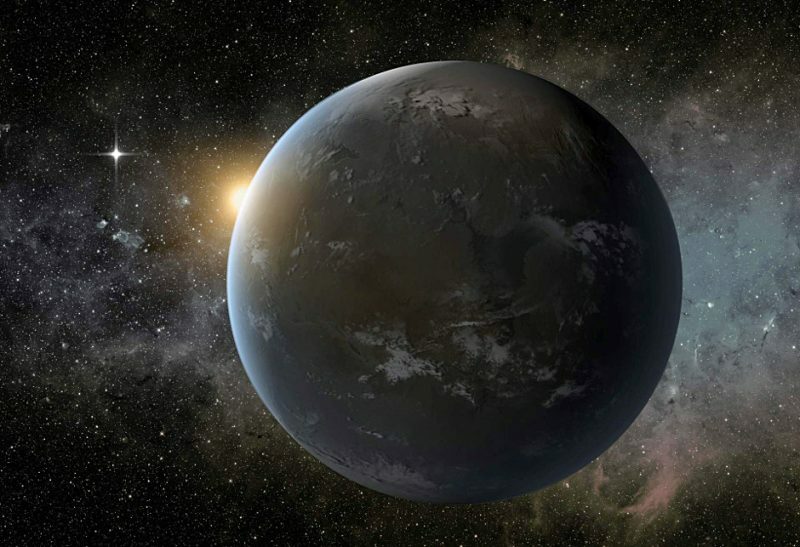 The new study results could also have implications for rocky exoplanets orbiting other stars, such as the super-Earth Wolf 1061c in this artist’s concept image. Many of them could have abundant water, just like Earth. Image via NASA/Ames/JPL-Caltech. Bottom line: The origin of Earth’s water has been debated for a long time, but this new study points to a source – the solar nebula, or cloud of gas and dust left after the sun’s formation – that had been previously mostly overlooked. The new work, based on computer modeling, may have implications for rocky worlds orbiting distant stars.